Cherry Mobile Flare X is packed with LTE connectivity, 64-bit octa-core CPU, 3GB RAM and 13MP camera! It's more than a bang-in-the-buck! Cherry Mobile Flare X is the local company's answer to the downpour of international value-for-money handsets released in the country. 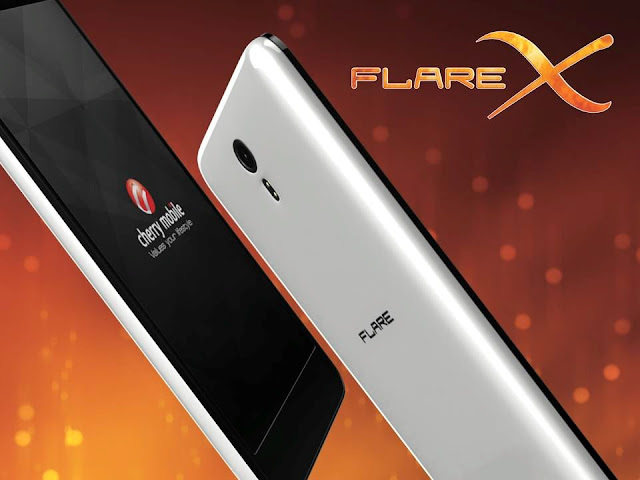 The popular "Flare" brand even gets stronger with the addition of this powerful beast that is set to take on several names in the mobile industry including Meizu, Alcatel, Asus and Lenovo. What does the "X" moniker in the Cherry Mobile Flare X means? I'm glad you're asking the same thing. So to those who are holding off in buying a Meizu M1 Note or an Alcatel OneTouch Flash Plus, this is your chance to get a better deal. The Cherry Mobile Flare X was announced earlier in the company's Octa-core Overdrive event. This handset is basically the first-ever Flare handset to come with an eye-popping (well, at least for me) 5.5-inch Full HD display. Yes, it's a phablet and it can definitely sit with its peers - Meizu m1 note, Lenovo K3 Note and Asus Zenfone 2. The display comes with In-plane Switching technology and One Glass solution. The screen is also treated with Gorilla Glass 3 and offers 1920 x 1080 pixels. With the price of Php 6,999, the Cherry Mobile Flare X becomes one of the cheapest octa-core handsets as of this writing. It packs a MediaTek MT6752 chipset which features a 64-bit octa-core ARM Cortex A53 CPU running at 1.7-gigahertz speeds and Mali T760 GPU for graphics. The chipset is comparable to the Snapdragon 615 from Qualcomm and better than Snapdragon 410. One feature that gives shade to other bang-in-the-buck international brands (which normally have 2GB) is the beefy 3GB RAM. This gives the Cherry Mobile Flare X, not to exaggerate things, a potential to be a benchmark killer. For those of you asking for the advantage of more RAM, better GPU and more CPU cores - the answer is better multitasking, fast app launching and immersive gaming experience. The Cherry Mobile Flare X packs a 13-megapixel Sony IMX 214 camera which is quite popular in terms of mobile photography compared to other sensors. Likewise, the front camera is defined by a 5-megpaixel sensor which will definitely be a worker in terms of getting selfie shots. The MediaTek MT6752 in the Cherry Mobile Flare X also includes a blazing fast 4G LTE connectivity which is basically a Category 4 dual-LTE. The WiFi connectivity has a dual-band capability (802.11n); there's also the Bluetooth 4.0 for high-performance support to wireless devices. Just like any other device on this level, the Cherry Mobile Flare X comes with a juicy 3000 mAh battery to support its powerful hardware. For quite a while, we have been waiting for a local device that could compete with the slew of high-performance yet affordable international brands in the Philippines. Well, Cherry Mobile X is a good start for a local company. And when we thought that Cherry Mobile could hardly give us another hit, we have been proven wrong. Check out the rest of the specs below to see why.